A pamphlet Viacom distributed at recent diversity conferences. Viacom content rolls from screens across more than 180 countries and in dozens of languages, reaching more than 4 billion subscribers. Every single piece of this content is the result of dozens or hundreds or thousands of workers who do everything from directing to producing to lighting to catering to set design – and most of them do not work directly for Viacom; they work for independent companies, vendors that Viacom contracts to execute the particulars of production or logistics or supply delivery. This enormous footprint presents Viacom with an equally enormous opportunity: to proactively seek out diverse suppliers, echoing the company’s varied programming and strong internal culture of diversity and inclusion. Under the company’s new supplier diversity initiative, led by Viacom’s sourcing team and its Office of Global Inclusion, the company is doing exactly that, actively forming new partnerships that are broadening opportunities for minority-owned shops while bolstering Viacom’s own business by offering a wider array of creative perspectives. “When you look at the amount of spend we generate both through media networks and Paramount, it’s an incredible opportunity to diversify our partnership base,” said Viacom Executive Vice President and Global Head of Inclusion Strategies Marva Smalls. The first step to diversification was to simply catalogue Viacom’s current vendor pool, a massive undertaking. 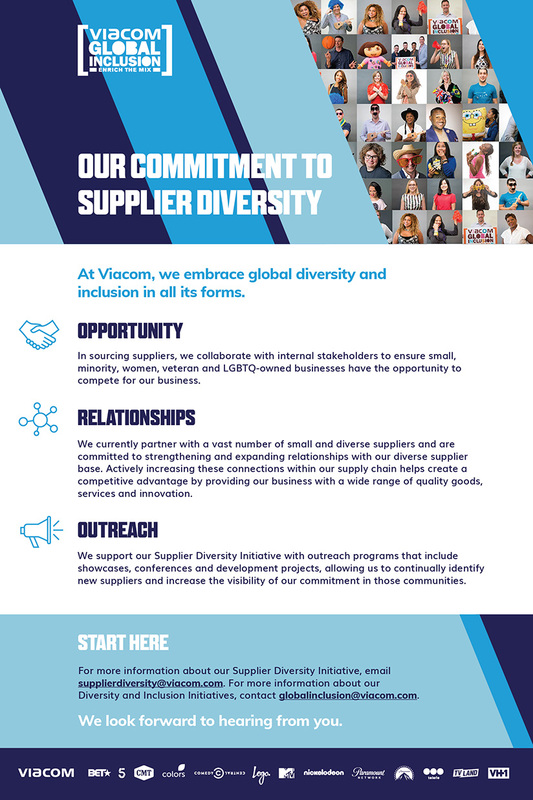 Aside from changing internal procedures to document whether incoming vendors are diverse, Viacom joined several minority-focused councils that work with certified (meaning the businesses are at least 51 percent minority-owned) suppliers: the women’s business council WBENC, the LGBT business advocates NGLCC, minority supplier group NMSDC, and disabled veterans business representatives Disability:IN (formerly USBLN). So far, approximately 1,100 of Viacom’s vendors have either self-classified themselves as diverse or fit into the rubric to be certified by one of these organizations. The reach of these certifying councils is substantial. The National LGBT Chamber of Commerce (NGLCC), for example, which claims to represent the interests of more than 1 million LGBT U.S. business owners, which it can connect with Viacom via networking events and access to its deep database. Viacom’s goal is to form long-term, immersive partnerships with each organization, underscoring for their members the company’s sustained commitment to diversity. Building such a network also creates an echo affect, a sort of street cred where partner companies validate Viacom’s commitment not just to diversity, but to supporting the small businesses that most of these operations are. Viacom is also coordinating with its peers to identify minority-owned businesses. Last year, Viacom co-hosted a networking event with Disney, Time Warner, CBS, NBCU and others, during which minority-owned vendors could meet representatives of many large companies at once. Take, for example, Jax Media, a New York City-based, minority-owned production shop. The company parlayed a single off-the-air Comedy Central presentation a decade ago into production of multiple series for the network, including hit series Broad City. The company also produces TV Land’s Younger and has collaborated with MTV and Paramount Network. Nickelodeon similarly points to the experience of Ne’e Leau, the Samoan-American owner of Scenic Storage in Los Angeles, who started as a stagehand with Nick 20 years ago. His business now manages the bulk of the network’s set storage in the city. While both Nickelodeon and Comedy Central established these relationships prior to Viacom formalizing its vendor diversity program, the rise of their vendors from bit player to lead actor demonstrates the power of investing in a diverse workforce. One of the core purposes of Viacom’s sourcing organization is to drive either the price or volume of products or services lower. Diversity, as it turns out, is a highly effective way to achieve this. Viacom hopes to incrementally increase its number of diverse vendors, underscoring the importance of broad inclusivity to the company’s business plan. Indeed, the vendor diversity effort largely echoes the larger Viacom culture. Viacom has spent years curating a strong internal culture of diversity and inclusion, led by Smalls, who says that Viacom’s employee resource groups are often used as a model for companies that want to institute such programs. “We’re not just fostering an environment of inclusion, we’re fostering an environment of belonging, where people feel they’re supposed to be here,” she said.